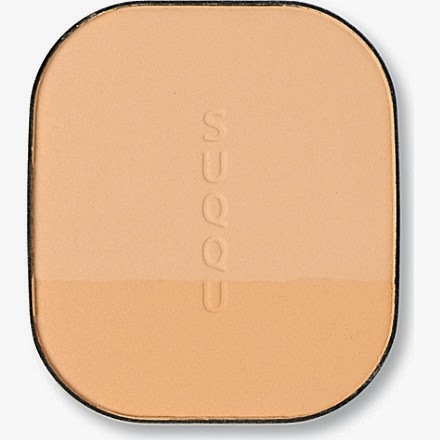 Having splurged on Suqqu's amazing cheek brush over the summer, I was keen to try out some of their other products. 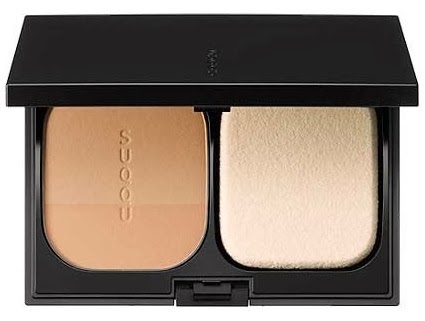 This is the first of a couple of reviews on Suqqu Stuff - their Dual Effect Powder Foundation, a powder foundation which, really cleverly, has two formulations in one compact, targeting both your t-zone (oilier, in general) and your u-zone (dryer, in general). It's a good idea, as most people will find that powder foundations are simply too dry on the non-oily areas of your skin. Full coverage. Applied sparingly with the sponge (as sparingly as you can) it's still a "heavy medium" to "light full". It doesn't really sheer-out. It gives enough coverage to double up as concealer for minor blemishes, although I have found it a little too dry to work as an under-eye concealer. Very, very, very matte on initial application, as you'd expect with a powder foundation. As it wore, and as the day wore on, it became more satin (as would be expected). You can use a finishing spray with this if you like, you don't need to, it doesn't really make much difference. You can powder it if you like, it doesn't really make any difference there either. Standard enough eight hour-wear, fading gradually over the course of the day - my nose in particular suffered the most. Nothing to do with my t-zone, because my chin and my forehead were not as faded. There are very few shades available in this foundation, only six of them in fact. 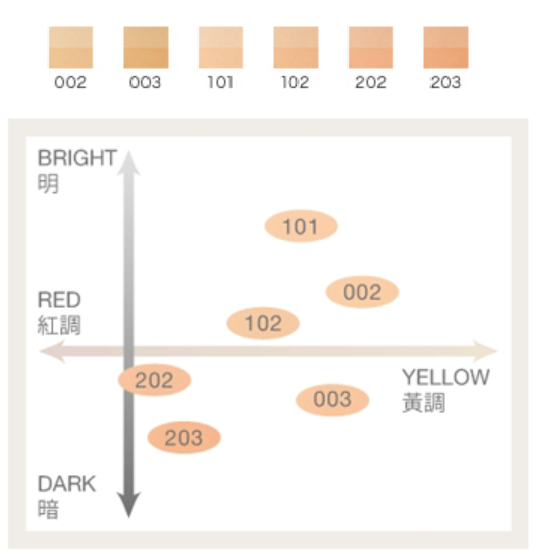 I have been using shade 101 and it's very slightly too pale for my NC25 skin of the moment, but 002 is slightly too yellow for me, and 102 slightly too dark. There's a rather complicated looking graph on the Suqqu website showing where the shades fit in, but roughly speaking, in terms of light to dark, the shades run as follows: 101, 002, 102, 202, 003, 203. In terms of undertones (pink to yellow), the shades run slightly differently: 202, 203 are more pink-based, with 102 being more neutral and then 101, 003 and 002 being more yellow. The sponge that ships with it. Or any other dense sponge will do the trick nicely (a dry one). It applies like a dream, it absolutely glides over the skin. My shade. More or less. There are two different formulations in the one compact - as mentioned in the introduction, the bigger area is for the t-zone area. It's whisper light and is formulated to control the excess sebum that causes skin oiliness and dullness. To a point - ref Wear section for How My Nose Got On. The foundation claims it covers pores, and yes, I can attest that it does. The smaller area is for the u-zone, ie the rest of the skin (non-oily part). 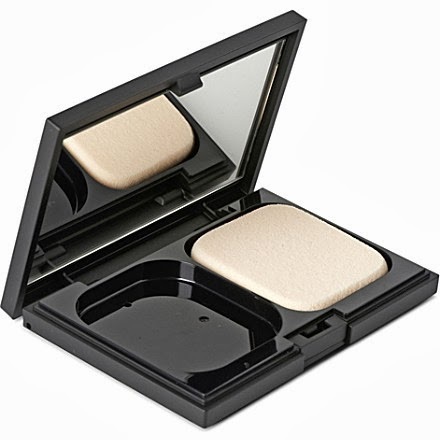 Both are powder formulations, but the smaller area is creamier, barely noticeably darker, and designed to be used around the edges of your face and in the non-oily areas. It contains skincare ingredients which ensure that this part of the foundation prevents the skin from getting dry (yes it certainly also does that) and smoothes-out any unevenness (yes, it's not bad at that either). So far so true, claims-wise. Only complaint? For me, I'd like the smaller area and larger area to swap sides - I have dryer skin so a large U-Zone portion would be handy. Too bad this isn't an option! This one works nicely on normal, through combination, and oilier skin types. Although the dryer parts of my skin didn't complain, didn't become patchy (after a few days of using a powder foundation, they'd usually be Sahara-dry, not so much with this product), it worked better on the oilier areas. This is (like all Suqqu stuff) not cheap. The foundation will set you back £49 (for 11g) in Selfridges London (the closest place you're going to be able to get this in Ireland) - that's around the €60 mark. Now - and this is where I get somewhat vexed - this is only the refill. For the compact, you need to fork out an additional £15 for the case, which contains the mirror and the sponge. Considering you'll need to change the sponge every time you need to replace the powder foundation, it would make more sense to ship the sponge with the foundation, but they don't, which means you either use a yucky old, used, sponge, buy a cheaper one somewhere else, try to wash the current one (bloody difficult) or fork out an additional £15 for a new sponge each time - ehhhh, no, sorry. This contains SPF25 and it does flashback somewhat.